SoftPlanet makes it possible for everyone to get free uTorrent download directly from our servers. There is no registration needed for downloading. Since its creation in year 2005 µTorrent has become the most used BitTorrent client in the world and it continues to gain popularity and acknowledgment. 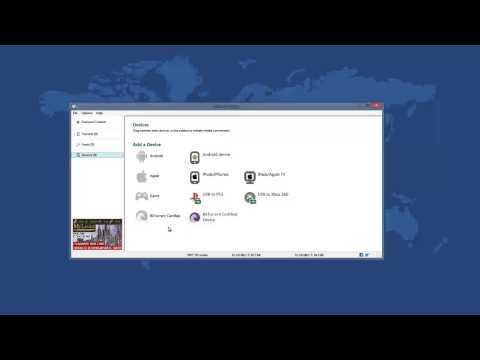 A lot of people use this great program, since its best feature is that it takes so little memory to download large torrents, compared to other BitTorrent clients, that you actually don't feel the program working in the background until it's done and a message tells you that you can use your download. And of course like most of the torrent clients, the program is free. But its biggest disadvantage is that it comes with a lot of unwanted software and adware that it can flood your computer in no time. But still if you are careful with what you download, then there's nothing stopping you from using the best BitTorrent program in the world. 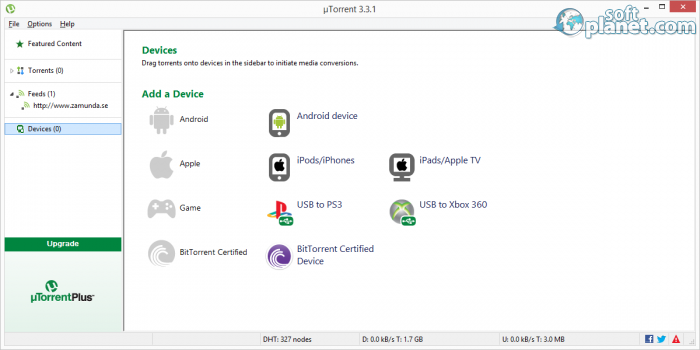 Since the main function of the program is to download, µTorrent does it to the maximum of the capabilities of your Internet connection and on top of that you don't even feel the app working. You have problems with your memory usage only when your computer is too old and there are a lot of simultaneous downloads. But to control this problem you can always limit the speed of µTorrent or pause some of the downloads and you'll be fine. But even when under load, the app is still much better than other BitTorrent programs which could even cause a standstill to your operating system. When you download a lot of torrents, you can even start losing yourself in their numbers, but here µTorrent has a solution, as you can sort them by Name, Size, Status, Download and Upload Speed, Rating and others, but the most useful is the sort by the date it was added and also completed on. All this information is situated on the main screen of the torrents tab, and below it you have additional info like what files are in the torrent, info, peers, ratings, trackers and the speed in general. In this way you have so much information about your torrents that you can't even think of anything else you'd need to know. There also are buttons with which you can add torrents by the URL or file, and also you can create a new torrent from there. If you want you can start the download, pause it or stop and all these functions help you to control and manage every download or upload. And to this user friendly profile you can only add that µTorrent can be operated in the staggering 66 languages which makes the program very easy to use. Besides the standard download with µTorrent 3.4.3 Build 40097 you can also add RSS Feed that allows you to automatically download from your favorite torrent website, which adds torrents using RSS. But the best functionality of the program is that it can use many devices by dragging torrents in the tab of the devices and initiate media conversions. You can use Android devices, iPods and iPhones, iPads, Apple TV, USB to PS3, USB to Xbox 360 and also BitTorrent Certified Devices. There is also the option to add featured content, but that probably is the worst function in the app, because if you use it your computer will be filled with a lot of unwanted software, videos and ads. But if you don't use it you can still receive a lot from the program, as it offers nice control with a large number of options from the preferences menu. µTorrent 3.4.3 Build 40097 is fast, reliable and full of features. Is it enough for you? It is, for most people. Actually thus it is the most famous BitTorrent client on the planet. There is no time to hesitate, just grab it and enjoy it. Our security scan shows that uTorrent is clean from viruses. The current version of uTorrent has been scanned by our system, which contains 46 different anti-virus algorithms. That ensures that uTorrent 3.4.3 Build 40097 is 100% safe for your computer.